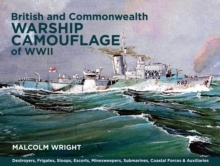 During the Second World War navies developed low visibility camouflage, applied to both the vertical and horizontal surfaces of their ships, in order to reduce visibility by blending in with the sea, or confuse the identity of a ship by applying obtrusive patters. 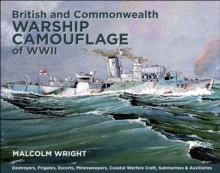 In this volume by maritime artist Mal Wright, all the paint schemes that adorned the cruisers, minelayers and armed merchant cruisers of the Royal Navy and Commonwealth are depicted in detail, along with discussion on changes of armament and electronics that effected the outward appearance of each ship.Beginning with the older cruisers, the book goes on to cover all the other cruiser classes taking in heavy cruisers, prewar cruisers, prewar and wartime cruisers; a large part also covers minelayers and armed merchant vessels (AMCs). Where possible both sides of the ship are depicted. 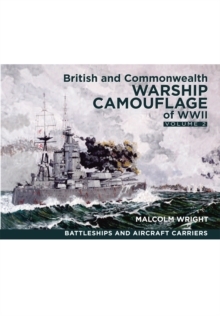 With 800 full colour illustrations, arranged by ship type rather than camouflage scheme, this book concentrates the clearest possible information into a single volume to provide a one-stop reference source. 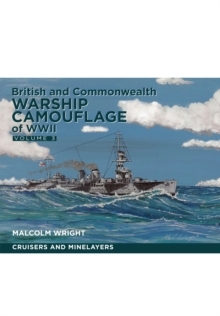 Many schemes would be difficult for any reader to unearth other than with the most intensive research, so this work is an invaluable tool for historians, collectors, modelmakers and wargamers.